Quintus Caecilius Metellus Numidicus was the leader of the conservative faction of the Roman Senate and a bitter enemy of Gaius Marius. 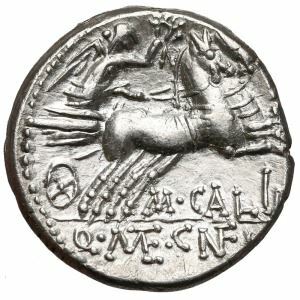 He was moneyer in 117-116 BC, and struck coins jointly with his colleagues, Cn. Fulvius and M. Calidius. He served as consul for 109 BC, and was the chief commander in the Jugurthine War in Numidia until Marius displaced him. He later became a censor, entering into exile in opposition to Marius. Metellus Numidicus enjoyed a reputation for integrity in an era when Roman politics was increasingly corrupt. Accused of extortion on leaving his governorship, the judges were so convinced of his good character that they dismissed the case against him unexamined. He was generous in his support of the arts, sponsoring his friend the poet Archias, and Cicero spoke highly of his oratorical skills.